One of the main aims of the Affordable Care Act (“Obamacare”) — the 2010 health-care law that created online marketplaces to buy insurance, and expanded financial aid to people who couldn’t otherwise afford insurance — was to reduce the number of Americans without health insurance. On this front, the law has been successful — as we noted in September here at Diabetes Flashpoints, it has allowed more than 15 million previously uninsured Americans to get health insurance. It has also led about 11 million more Americans to say that they find health care affordable, according to a survey mentioned in that post. But despite expanded access to health insurance, many Americans — even those with insurance — still find health care unaffordable, as the results of a recent survey make clear. Conducted by The New York Times and the Kaiser Family Foundation, the survey found that about 20% of adults under age 65 with health insurance had trouble paying medical bills over the last year. In contrast, 53% of those without health insurance reported trouble with medical bills. Among those with insurance who had trouble affording health care, 75% said they had cut back on household spending, 63% said they had used up all or most of their savings, and 42% said they had taken on an extra job or worked more hours. About 60% of people with insurance who had trouble affording health care got their insurance through work, indicating that the plans sold on the Affordable Care Act’s new health insurance marketplaces aren’t the source of the problem. 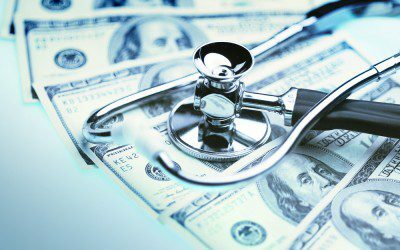 Rather, the trend to charge more in out-of-pocket expenses to people with health insurance has been gaining momentum since the late 1990s, according to the Times. But this trend has been growing more quickly in recent years. It has had the mixed effect of making insurance more affordable to more people, but sticking them with a bigger bill when they actually need to access health care under their plan. Cutting back on spending, tapping savings, and working longer hours aren’t the only consequences of having trouble with medical bills that the survey found. Among those with insurance, 38% took on more credit card debt, 34% reported being unable to pay for basic necessities like food and utilities, and 14% had to move out of their homes. Many sought outside help to pay their bills — 37% borrowed money from friends or family, and 11% went to a charity or nonprofit group for help. What’s your experience with out-of-pocket medical costs — do you have insurance that covers most of your costs, or are there gaps that leave you with large bills? What types of treatments, prescription drugs, or medical supplies tend to impose the biggest financial burden on you? Have you had to make adjustments in your life because of health-care costs? Do you think insurance providers should be required by law to cover a greater share of health-care costs, even if this means that health insurance premiums go up? Should there be greater assistance from the government to cover insurance premiums or out-of-pocket health costs? Leave a comment below!